Tents and blue tarps form small villages within a crowded park. Young, dreadlocked faces sit on display, conscious of their viewers but focused on existing independent of the passers by. A steady stream of sympathizers, or should I say sympathizers and spectators, or is there really a difference, walk down congested aisles, in between the tarps, reading signs, and glancing, occasionally engaging someone from “within” the movement. But really what is “within” in a movement such as this. Where do we draw the line between observation, perpetuation, and participation. With no policy or defined agenda, it seems “within” extends well beyond the walls of Zuccotti park. To participate in Occupy Wall Street I believe lies simply in consumption of it without disdain. Defined along those lines, I see a movement that has grown in mass to a level well beyond the General Assemblies and regional offshoots, to a much more mainstream demographic that I will identify not as sympathetic to the “cause” if there is a “cause,” but rather “perpetuetic” of a loosely defined message that has somehow come to be in vogue. Say what you will about the lack of organization or clear asks, one thing is for sure: it is not cool to be against Occupy Wall Street. My peers who work at hedge funds take girlfriends there on dates. The most influential venture capitalist in New York tweets that he is going to “listen and learn,” and beautifully clad models and fashionistas walk amongst the tents in Prada, rubbing elbows with the gutter punks who have not showered in weeks. What emminated from an ambition to shine a spotlight on the wealth gap and the disparate realities between the 99% and 1% (of wealth), has somehow gained support amongst a typically apolitical, and certainly unconscious segment of the population. 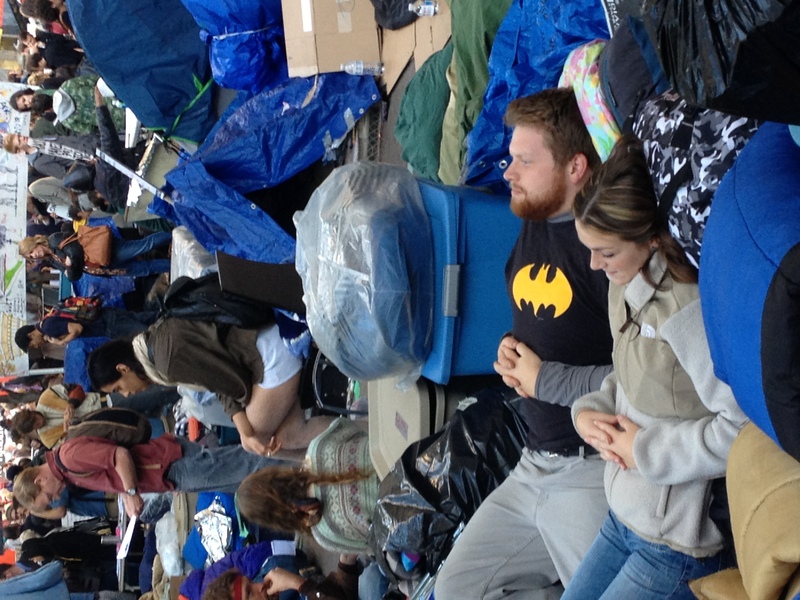 There is a social identity that has formed around acceptance of Occupy Wall Street, and it has roots in much more generic empathy toward concepts of protest, and movement, and change in general. Independent of socioeconomic background and political ideology, we want to believe that we live in a place where people have an ability to change the way things are….in any direction….right or left, up or down, there is something about spread and traction that inspires and excites. The sheer fact that that which is not understood initially gains strength and does not die, causes the neutral to sway into momentum. Suddenly, the spread starts skipping or jumping beyond adjacent groups or demographics into unpredictable pockets and populations and people begin to believe that it will have some permanence. I see this happen with social applications such as Twitter or Instagram, and the characteristics and dynamics of Occupy Wall Street’s spread look very similar. Those initially unwilling to invest in or support, out of a belief that their effort would dissipate into the ether, observe those around them engaging, and themselves become involved. The neutral are starting to sway toward momentum, the output of which may just be something sustaining. I don’t think the deoccupation of Zuccotti park, which seems inevitable in the near term, will mark the end of this movement’s impact. No piece of legislation or individual election will define the “outcome” of this phenomenon. I believe the greatest impact possible will come in the form of a shift in collective consciousness of the neutral and even opposed 2 or 3 or 4 degrees from where it is today. The shift will not necessarily be toward empathy for the 99%, but perhaps more fundamentally toward an awareness and belief in bottoms up change that perhaps has been lost over the past several decades. We currently live in a “post-social media” world, where young and old generations have come to understand that their voices and sentiments can spread well beyond the bounds of their immediate surroundings, and I am fascinated by a physical representation of that confidence that is embodied within the Occupy Wall Street movement. Like any current that spreads through and across social graphs, amplification through the media (which may be the most notable accelerant that has resulted from physical assembly vs virtual discussion of the wealth gap) has perhaps brought attention to an application of post-social thinking less visible than “find your friends.” Could it be that the seemingly small gift of an amplified individual voice has set the stage for an irreversible redistribution of influence from the top to the bottom? Maybe it’s not the 1% of wealth that the 99% are catalyzing against…maybe it’s the 99% of influence that the 1% of influence are re-appropriating?